My many years working in the travel industry has allowed me the luxury of tasting many different foods and wonderful desserts. One visit was to New Orleans, Louisiana, a fabulous place to visit if you like food, music and lots of fun! And one of my favorite stops is Café du Monde in the French Market. The French Market is comprised of seven buildings, anchored at the Jackson Square end by the Café du Monde and on the other end by the Farmers and Flea Market sheds. You must visit this area when you go to New Orleans! The Café du Monde is famous for its beignets (pronounced BEN yays). The beignet is a square piece of dough, fried and covered with powdered sugar. It's kind of like a donut without the hole...but much better! On one of my visits, I picked up the mix to make these delicious little fritters at home. Elliot (my son), has been my official taster over the years. It was just the two of us, but now he has a tasting apprentice, Dan, my wonderful husband. When the two of them get together and critique my baking, it is quite amusing. Elliot loved these beignets and then the unthinkable happened... ohhhh yesss.... I ran out of the mix!!!! He was young and really didn't understand how I was relying on a box of powdered beignets. He looked at me in that son-ly way and asked if I could make them anyhow. "But this is special powdered beignets...from New Orleans...I don't know how to make them". Off I went, searching through recipe books until I found a beignet recipe. You can order the mix online now. but... these are better than the mix....even Elliot thinks so. The recipe is from a wonderful little cookbook called James McNair's Breakfast. 1. Sprinkle the yeast over the water in a small bowl and stir to dissolve. Let it stand until foamy, about 5 minutes. 2. In a large bowl, combine the sugar, salt, evaporated milk, egg and shortening. 3. Stir in the yeast and mix well. 4. Gradually add the flour, about 1 ½ cups at a time, mixing until blended. 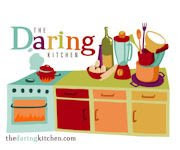 (You can use a mixer with a dough hook or just use your hands once it gets too difficult to mix with your spoon). 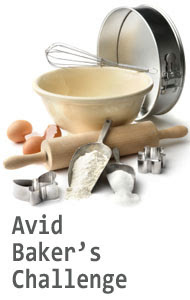 Note: if you plan on mixing a lot of dough in the future, you may want to get one of King Arthur Flour’s dough whisks. I love mine. 5. Place the dough in a lightly greased bowl and cover with plastic wrap. Either refrigerate it several hours or overnight. Note: I recommend you making it until this point the night before, so you can easily complete it in the morning for breakfast/brunch. 7. Pat or roll out the dough until ¼ inch...not too thin! 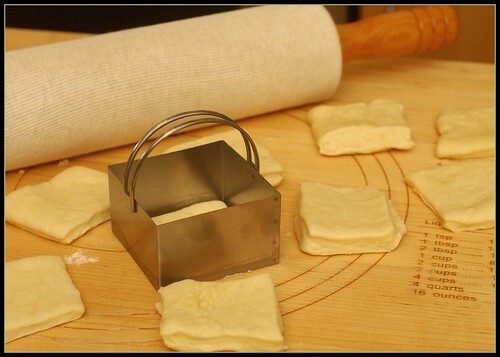 Cut the dough into 2 x 3 inch rectangles with a sharp knife - or use square biscuit cutters...it really doesn’t matter! Keep them relatively the same size though, so they will take about the same time to fry. 8. Drop them 3 at a time into the hot oil , turning a few times with tongs or a slotted spoon until golden brown on all sides. DO NOT LEAVE THE STOVE!!! THEY NEED TO BE WATCHED!!! 9. Remove with a slotted spoon and drain on paper towels. 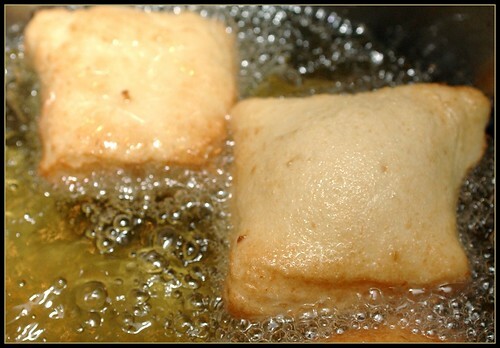 Note: if they don't puff up they are either: too big, too thin or the temperature of the oil has decreased too much. 10. Sprinkle very generously with powdered sugar . 11. 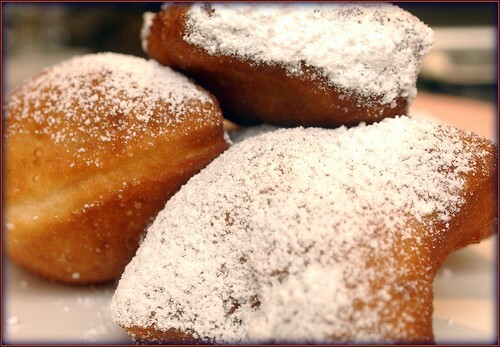 Now put on some Zydeco music and serve these amazing beignets while they are hot /warm with coffee or tea..and imagine you are sitting in the french quarter in the fabulous city of New Orleans. Bet you can't eat one! I went to the Cafe du Monde just before Katrina... you brought back some nice memories with your beignets! these look beautiful!! i love anything with yeast. haha i think it is just the funnest ingredient to use. You just sparked lots of memory for me. I love Cafe du Monde and I love those sweet beignets even more. Yummy. Someone just gave me the mix recently actually. Those do look amazing though. I think whenever something is made from scratch it is certainly always better than a mix. Joanna, Yes people are quite impressed when these are served. Kelly, it is worth trying the mix so you can get a feel for them...then when you make them from scratch and they taste better, it feels great! I love the Cafe du Monde beignet mix...and the chicory coffee you can get to go with it, our neighbour gave us a gift of both and they were fantastic, I could eat some right now. If you like sweet breakfasty things like the beignets I have a recipe for Welsh cakes (the ones King Alfred burned!) on my blog...they are like fried cookies and taste great hot or cold. Ha! Just this morning I was lamenting to someone else that I only get to have beignets when my mother somehow obtains a box of mix from Cafe du Monde! The recipe that is in Joy of Cooking tastes more like funnel cake than beignets. Thanks so much for sharing your recipe! Yay for Cafe du Monde!! I have fond memories of eating their beignets at midnight after my senior prom (and hundreds of other times too). The French Quarter looks wonderful- and the rest of the city is coming along well too- come back and visit soon!